I’m watching Olympic synchronized swimming with Aitza. It’s freakish. The nose plugs alone make me cringe. They make the athletes look like mutant aquatic bat-humans. Aitza created her own Olympi-vision, which involves watching the sports in fast forward. You get more sports in half the time and you don’t have to listen to the incessant drivel spouted by the announcers. It’s also more exciting because the athletes are twice as fast. Man, can Usain Bolt run in Olympi-vision! So while we were watching the Russian robots thrash about with perfect underwater double-speed scissor kicks, I made the mistake of asking Aitza for the notes on what to write about for the blog. I have memory issues. I wouldn’t doubt if my brain was dipping its proverbial toe in the Olympic-sized pool of dementia. I do have Alzheimer’s disease as a genetic legacy. My Nan had it. So I write down notes in a notebook, and then promptly forget where the notebook is. This gives Aitza free reign to point out all my memory flaws. “How does someone forget what he’s going to write about? How does someone forget where he put the notebook where he wrote the notes so he would remember what to write about?” Hey lady! If I wanted to be ragged on 24/7, I’d get a wife! Ummmmm. So now we’re watching the equestrian horse jumping, which reminds me of Shade on his horse. (Who needs a stupid notebook?) Last time Shade was riding his long-faced buddy, Ivan, he became a bit dizzy. Sandy from LifeSkills was with him, giving him support, along with three other assistants, so he wasn’t going to topple. Sandy said that the dizziness comes from Shade’s brain recognizing the movements and making new connections. From what she describes, it’s a good sign for healing. Not so good if he’s show jumping though. We just watched the Grenadian (doesn’t Grenadine sound better for the nationality? ), Karani James, win the Men’s 400, which reminds me of Shade’s other exercise achievements. His YMCA trainers and his rehab physical therapists said that Shade displayed a lot more core strength last week. Perhaps the exercise is paying off. Still, his strength is sapped by his Kryptonite: lack of naps. He might have a six pack that you could chop wood on (not an Olympic event), but without his nap, the only physical activity he excels in is marathon crankiness. (1,000 meter kayak is on. Oh yeah, that reminds me…) I took Shade to the YMCA today because his rehab was cancelled. I figured I would get him on the erg, which is the hip term for a rowing machine. After all, Shade used to be on the OARS rowing team in Windermere. (Not quite kayak, but close enough.) However, I had been warned by PT Melody to take it easy on the erg machine and to break the exercise down into its various parts. So I explained to Shade that he would first try just doing the legs and then just the arms, until he got his rhythm down. The complaints started to pour out of him like pool water out of an Olympic diver’s nostrils. “I used to row! This is stupid! This isn’t motivating!” and so on. I explained to him how he needed to break it down so he didn’t hurt himself. He started whining like a jaded Twitter addict complaining about NBC tape delays. In total, we were in the YMCA about 15 minutes before I bustled him back into the car. Then after a nap at home, he scooched over to me and said, “I’ve had a nap, I’ve pet my kitty, and now I’m ready to work out.” So we did a half hour of push ups and leg lifts and stretching with no complaints. Obviously, I will not be medaling in Olympic Patience or Awareness, though I think I’ve got a good chance for gold in the Long-Term Forgetfulness and Broad Insensibility. If you happen to be a member of the Dr. P. Phillips YMCA, go down the hall towards the weight room and look on the wall to your right. There’s a poster of Shade on the wall with a short inspirational story about his time at the Y. Shade’s become quite the celebrity there amongst the staff, and a few weeks ago, the marketing team asked if we would mind them highlighting him. The Cramptons are never media shy, so I gave the big thumbs up. Then on Thursday, I gave a little speech to the YMCA Board at their monthly meeting. Do you think I could make it through the first sentence without starting to blubber? Not a chance. I’m such a baby. The good thing is usually when I tell the story, other people start to tear up, too, so I’m not the only wuss. It’s kind of funny to witness a bunch of suits sniffling and doing that hard, choked-up gulp. My literary superpower. I should write those cheesy inspirational stories for the Olympic segues that Bob Costas constantly forces on viewers. Mayan came with Shade to Lifeskills on Tuesday and helped, which means he basically did every therapy that Shade did because that boy cannot stay still. Seliena the therapist said Mayan was actually quite helpful because while he engaged Shade in ball throwing and bubble blowing, she could step back and observe without expending her concentration participating. It gave her a clearer idea of whether Shade was staying on task. And with Mayan bouncing around like a soccer goalie, basketball player, and baseball catcher, it gave Shade the impression that he wasn’t at therapy, he was at the Olympics. Shade’s therapies were canceled on Wednesday, so Aitza and Shade spent a lazy day playing video games. Shade taught Aitza Minecraft, which is essentially a very intricate version of virtual Legos. She had tried to learn from Mayan before, but he’s too intense and impatient. However, thanks to Shade’s delay, he is very patient and methodical and thus a great teacher. He even built a 200-block-tall tower so that his mom could find her way around the virtual world because without it, she was bumbling around like beheaded poultry. We’ve been watching daily the various sports in London. I’m hoping some of the Olympic feats will inspire Shade. I am especially looking forward to The Blade Runner, Oscar Pistorius, who is a very speedy double amputee running for South Africa. Sometimes Shade gets depressed about his limitations. The other day when he started doing the “poor me” routine, I told him about famous people who were in bad physical situations but accomplished greatness: Franklin D. Roosevelt, Stephen Hawking, and Blade Runner. That perked him up a bit. I’m just wondering what great things Shade will do in the future. Olympic hopeful? Perhaps if video games make it into the Olympics. Hello new stuff. Goodbye old stuff. Aitza and I made the switch two weeks ago. Now she takes Shade to therapies Tuesday, Wednesday and Thursday. I only take him Monday. In many ways, this is great. Aitza gets to experience Shade’s daily improvements. Shade gets quality time with his Mami. I get a break from the constant busing around. And Mayan. Well, he just does his thing. In some ways, it bums me out. I got so used to being with Shade during his breakthroughs that it’s weird not being with him. Now I get updates through Aitza. And she is much more patient than I am with his mood swings, and looks forward to the therapies. She’s all bubbly and positive about the day, and it makes me angry at myself that I became grumbly and negative. But it’s for the best. Shade and I were driving each other nuts. Now I can focus on work more and not feel like I’m constantly sinking under a flood of grading. And Aitza can share in his recovery more. Shade is enjoying his new vocal classes with Dr. Redding and has decided to join not only the Gotha Men’s Choir but also the community choir in Winter Garden. I’m glad that music will still be a part of his learning. Guitar was a huge struggle due to the intricate finger work. Singing, however, seems to be manageable for him, when he decides not to wail like a banshee. Shade shows off his Kinesio tape and huge pectoral muscles. Shade also started going to Orlando Sports Chiropractic. We figured that with all Shade’s sitting and slumping, he might be a bit misaligned. And we were right. The chiropractor, Dr. Sabrina Atkins, made Shade’s spine crackle like Chinese fireworks. She also applied Kinesio tape to his face, which may help improve his symmetry and bring a little life back to his right side. The therapy tape was used by an OT on Red Sox recruit Ryan Westmoreland who went through surgery for, you guessed it, “a life-threatening congenital malformation in his brain stem.” Read a bit about him here. 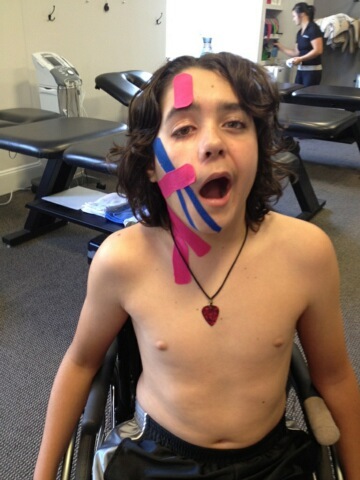 Shade picked bright colors for his Kinesio tape so that it looked like war paint. It definitely gets comments. Finally, Shade has been graduated out of Florida Hospital’s Occupational Therapy with Kristen. He’s just got four weeks left, during which he will practice note-taking skills to apply at school. He’s also going to switch speech therapists. Giselle, his current therapist, feels it will be good for Shade to experience another therapist. Maybe Jill the new ST will try some other techniques. PT continues with Melody, though she constantly changes his therapies to keep it interesting. Shade has also picked up a few OT sessions at Lifeskills. Sandy, the owner and our friend, is also the inspiration behind Shade’s recent hippotherapy sessions. At Lifeskills, Shade has been practicing ladder climbing, core strengthening on a wobbly peanut-shaped exercise ball, and finger strengthening exercises. So Shade’s progress continues. We’re always looking for new techniques to get Shade’s brain back to basics. I don’t think I’m stating anything new when I describe Shade’s torturous singing, a sad result of his brain explosion. He has a habit of serial killing songs. His vocals are reminiscent of branches being shredded in a wood chipper. When he hits high notes, I imagine the last terrorizing screech a field mouse hears as a falcon dives in, talons bared. Then he suddenly dips into an off-key zombie growl for half a note only to shoot back up to a nails-on-chalkboard scratch. Two planes crashing in mid-air emit more soothing sounds. Well, he’s been faking it. Last week, Aitza took Shade to meet Dr. Jeffery Redding. He’s not a “scalpel, clamp, suction” doctor or a “bend over” doctor. He’s a Ph.D. in Choral Conducting/Music Education and Director of Choral Activities at West Orange High School. We’ve known him back when he was a mere mister directing Arianny in Bel-Canto. Aitza called up Jeffery (After chaperoning many events with the choir, Aitza earned a first name basis.) and asked if he’d be willing to work with Shade on his voice and breath control. He agreed and met with Shade a couple times last week. Turns out Shade has fairly good range (he can hit tenor or baritone) and decent breath control. In other words, he’s a decent singer. He just doesn’t try when he’s at home. All that horrific sound abuse was just his idea of a joke that never ends. We are confident with the help of Dr. Redding, Shade will see the benefits of using his voice for beauty. He’s already expressed interest in joining choir at school. But we will have to deal with his song destruction until it clicks. At this moment, he’s mutilating Adele. Next Saturday is the one year anniversary of Shade’s traumatic brain injury. We’re throwing a “Shade Beat Death” party at our house, so if you can come, swing on by. Shade and Mayan’s grandfather, Efrain, whom we lovingly call Bubu, has reached 84 years of awesomeness today. He’s a powerhouse who still walks a couple miles every morning. He’s a crossing guard superhero who can take a bullet in the heart (or at least an attack worthy of a quadruple bypass) and still manage to get kids across the street safely. He has the adventure stories of Marco Polo and the wisdom of Yoda. And to top his list of achievements, he and his wife Aminta have been married today for 50 years, which makes Aminta a person of immense patience to put up with Bubu’s adventure stories and wisdom for half a century. Happy birthday, Bubu, and happy anniversary to both of you. Without you both, we could not have survived this past year. It’s also nice to know that two people can actually enjoy each other’s company after 50 years (or pretend very convincingly). It’s a goal Aitza and I long to achieve. Naturally we had a celebration to honor the patriarch of my wife’s family and his lovely wife, so Arianny and Fabian flew in from San Antonio, Texas, (the origination point of this blog) to share in the festivities. There were cousins and second cousins and third cousins visiting from Mexico, so the fiesta was lively and included a feast, a pool party and an all-woman mariachi band. You haven’t seen goofy until you’ve seen me try to dance to “Canta y no llores.” Ay Ay Ay Ay! The most beautiful tradition of the celebration was when each family member told a story about Efrain and Aminta and toasted them. I’d tell you some of the stories but after 14 years of marriage to Aitza, I still can’t speak Spanish because my cabeza is a graveyard where other languages go to die. So basically I sat there smiling like the dumb gringo I am without understanding more than a handful of words. It was great having Arianny here, not just because we could catch up and hang out, but because Arianny has the capability to handle Shade and Mayan without us getting stressed. That gave Aitza and I a chance for a one-night getaway at Champion’s Gate resort near Disney. One night of freedom without worrying about Shade’s needs. Arianny took him to all his therapies today while we floated in the resort’s lazy river and had a steak lunch. We weren’t even gone for 24 hours but both of us felt refreshed. The old “take care of yourself” adage rang true.